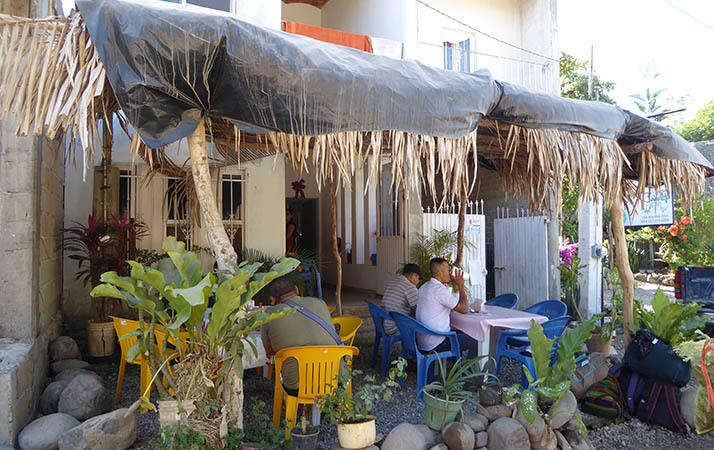 There are lots of different restaurants to choose from in the tiny town of Chacala. 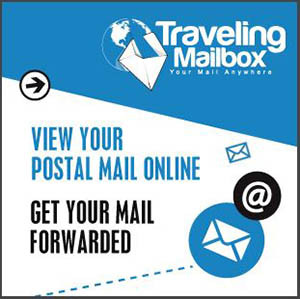 We've mentioned several already, like Mauna Kea Cafe, Chac Mool, and Chico's. 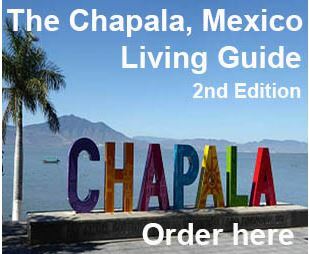 There are other eateries too, like the upscale yoga retreat, ones that serve local Mexican cuisine and even pizza! Other travelers alerted us to this particular breakfast-lunch joint out of the main tourist zone. We were happy to have found it. Check out La Fonda Doña Carmen below. Go up past the La Onda brew pub and La Fonda is located on the left hand side. You can't miss it. La Fonda is a simple place. It's where working men eat. Most likely this is Carmen's home as well as her business. 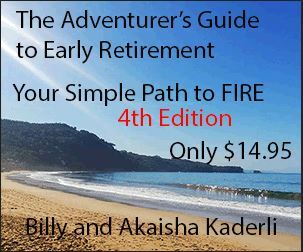 This is a very common practice, and what a great set up! You roll out of bed and you're at work. No commute! Here you see Carmen in her kitchen with all her supplies within ready-reach. 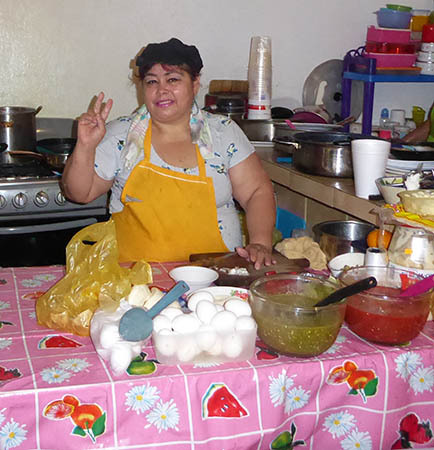 Green and red salsas, dozens of eggs, her chopping block, and her gas stove behind her. Refried beans are probably being kept warm in the pot on the back burner. This is the way the local trajabadores eat. Their bacon is cut up and mixed in with the scrambled eggs. 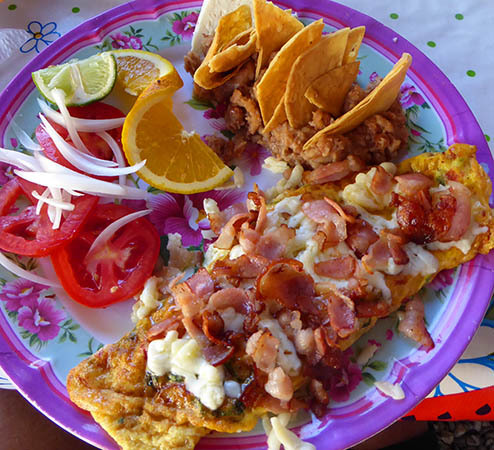 Served with refried beans, some "morning cheese" (fresh!) crisp chips, and a small salad of tomatoes and onions with a fresh squeeze of lime. All breakfasts were the same price, 65Pesos or about $3.50USD, and it included a pitcher of agua fresca - a freshly made "fruit juice water." That's a price hard to beat! 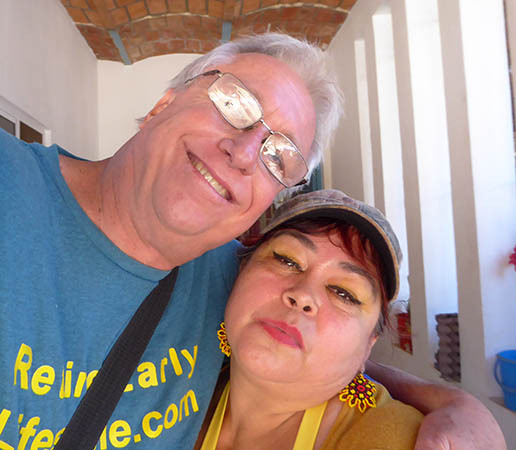 Here's a picture of Billy and Carmen - Two hams for the camera lens! Carmen's earrings are hand made native Huichol style beading. Brilliant colors and fine workmanship. You can find Huichol beaded items on many beaches of the Mexican Pacific Coast. 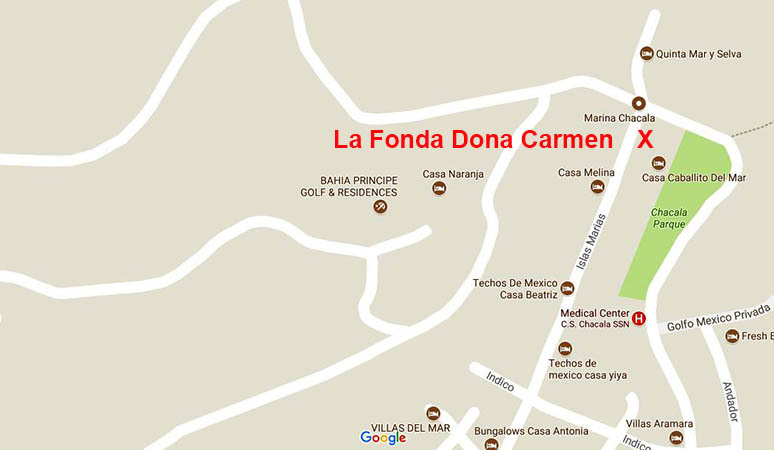 La Fonda Doña Carmen is a small place, but clean and well marked. The title of "Doña" is one of respect. The male version is "Don." You get this designation by working for it, and Carmen must have a solid business to have earned her being called Doña. Billy said this omelet was terrific. About 6 eggs and a pound of bacon! 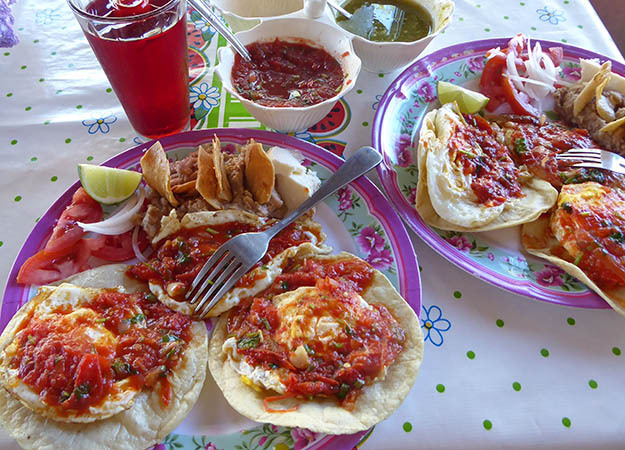 Huevos Rancheros is a common breakfast in Mexico and can be made with variations. 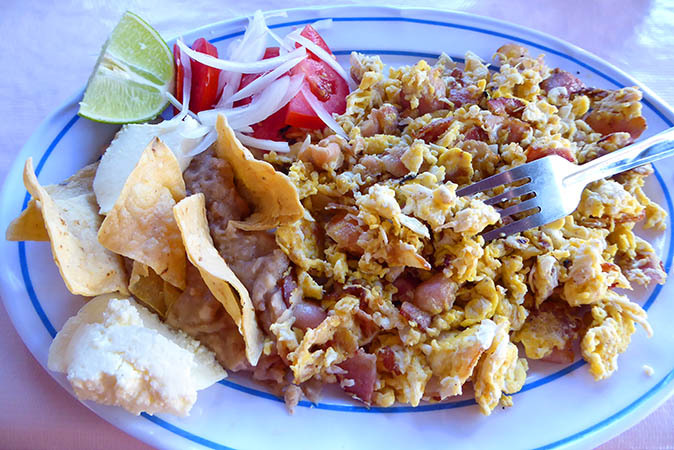 Sometimes the refried beans are under the eggs and sometimes they are separated such as you see here in the photo. They are made with both red and green chili salsas and the tortillas underneath can be crisp as a chip or made to be softer. "Usually" one gets only 2 eggs, but Carmen feeds the working men a heartier meal. Billy tried three different "waters" or aguas frescas as they are called. He had melon (cantaloupe), jamaica (hibiscus flower), and maracuyá (passion fruit). 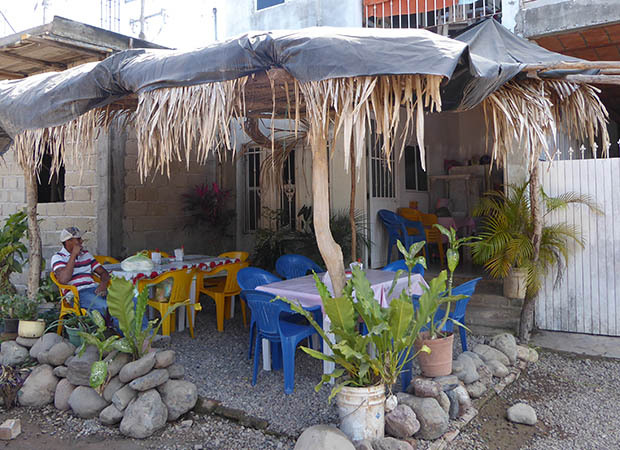 If you would like to try a local restaurant in Chacala with large portions and great pricing, check out La Fonda Doña Carmen.